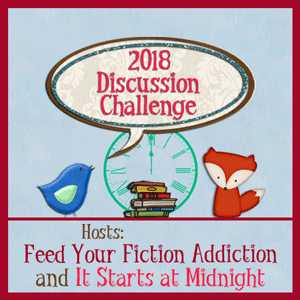 Welcome to the 2018 Book Blog Discussion Challenge hosted by Nicole @ Feed Your Fiction Addiction and Shannon @ It Starts at Midnight! Even when I’ve failed to complete specific reading challenge lists, I’ve still read a lot of books. What I haven’t done is post about them! This challenge is all about starting discussions on book blogs. I’m aiming for “Creative Conversationalist” with a personal goal of 12 posts, because one post each month sounds reasonable. Yay! So glad you’re joining us!